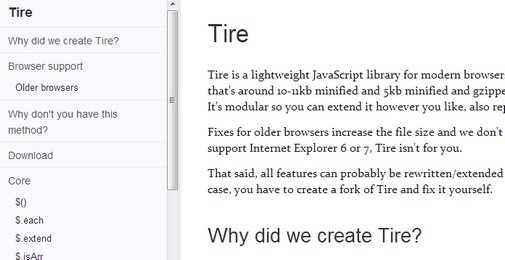 Tire is inspired by jQuery, however, unlike jQuery, Tire is meant to be modular and weights in at around 11K minified. Tire is meant for newer browsers, it does not incorporate fixes for older browsers, which would significantly increase the size of the library. Tire does not support Internet Explorer 6 or 7.